The disappointment and anger that some young people showed during a moment seven years ago has stayed with Scott Williams, shaping him still in these early days as the new director of youth ministry for the archdiocese. The moment happened when he was helping with a group of sixth-grade boys as part of the youth ministry program at SS. Francis and Clare of Assisi Parish in Greenwood, shortly after he had graduated from college in 2010. “I couldn’t be at one of their events, and when I came back, a couple of the kids were mad I wasn’t there,” Williams recalls. That love of a journey of faith with young people will continue to guide Williams, who became the archdiocese’s director of youth ministry on May 16. “My greatest hope is that by the time someone graduates from high school in our archdiocese, they will become some of our greatest leaders and take their faith with them to college, their workplace or wherever they go,” says Williams, who is 30. There’s also the challenge of conveying the beauty and the depth of the Catholic faith to an age group that is known as Generation Z, a high-school-and-younger age group of about 60 million Americans. “Our young people are changing the way they communicate and the way they grow up in our culture,” Williams says. “They communicate in pictures, sound bites and 10-second videos. They also learn more through visuals. So how do we hand down our tradition-rich faith to them? Change has also been a part of Williams’ involvement in youth ministry in the archdiocese. After working closely with the individuals in his youth group at SS. Francis and Clare Parish in 2010, he became the director of youth ministry at St. Jude Parish in Indianapolis from 2011 to 2014, leading a program that involved 600 youths. Since 2014, he has served in the archdiocese’s office of youth ministry, an experience that has included leading 104 youths on a 12-day pilgrimage to World Youth Day in Poland during the summer of 2016. Those experiences are just part of the reasons that Williams is a great choice to lead youth ministry in the archdiocese, according to Matt Faley, the director of young adult and college campus ministry for the archdiocese. That combination of vision and faith was especially evident as Williams planned and led the Indianapolis Catholic Youth Conference (ICYC) in 2016, Faley says. 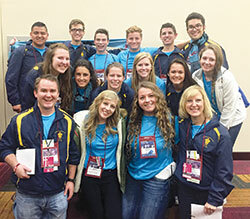 Williams is now one of the point persons for the archdiocese as it prepares to host the National Catholic Youth Conference—and about 25,000 youths from across the country—in Indianapolis on Nov. 16-18. He approaches such challenges as opportunities to help young people move closer to God, all the time relying on certain constants to guide him, starting with his wife Elisabeth, whom he married on May 28, 2016. In his office, he relies on a map of the archdiocese, the mission statement for youth ministry and his coffee pot. He especially relies on his faith, which has deepened during his journey of the past seven years—a journey in which he believes God is always leading the way.